I suppose if you push me I will admit I prefer silent films to any other format. I mean, if that’s the choice you give me. Th ere are a lot of reasons for this. Mostly, I think, because so many silent films were incredibly groundbreaking in so many areas including writing, direction, artistic quality, and method of acting. You can watch the growth take place right before your eyes. Despite the intervening years since their creation and release, silent films continue to resonate even today. 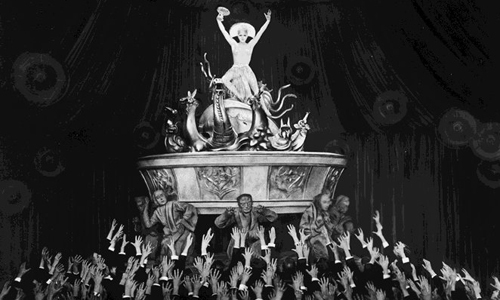 Metropolis is one example of such a film. I don’t know how many times I have watched this movie. Every time I see it I notice something new. I am not a huge fan of German expressionism, although I do like it. 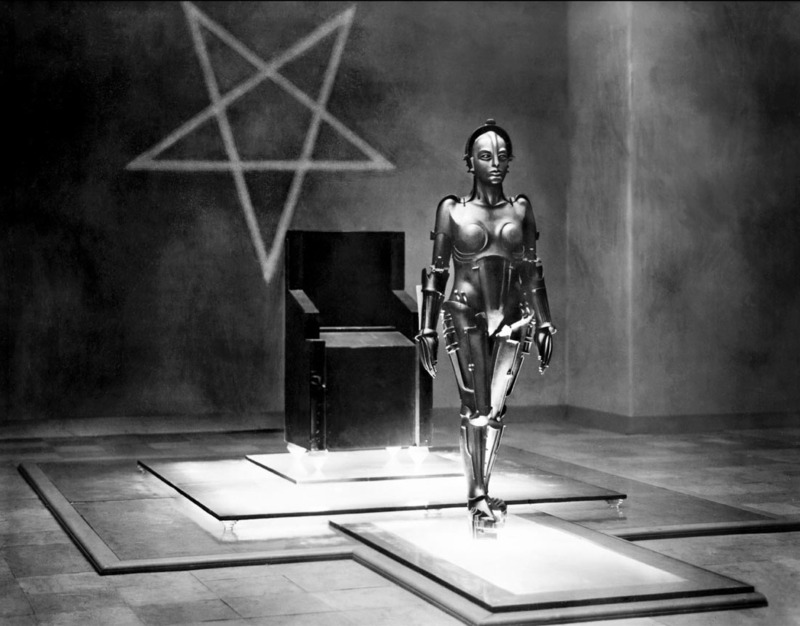 But Metropolis appears as if it combines story and art on such a high level of genius it is no surprise that it’s considered to be Fritz Lang’s magnum opus. Of course, I know some of the names of the characters in Metropolis. But they aren’t culturally tied to me, so I think that gives them a sort of freedom and makes the film itself a tabula rasa for anyone else who comes to it for the first time. When we watch any film, no matter what it is, we always bring our past experiences with us and draw upon them to help us understand what we are seeing, and process it. This is why going to movies, and reading, and attending operas and ballets and other forms of entertainment endure. They demand that we draw upon our past experience in order to interpret them. There is not only a social connection being made but a psychological one, too. I think as human beings we like that process. We understand it, or at the very least feel comfortable with it. We know Harrison Ford, at least through his modern day work. Most of us like him. We don’t know Brigitte Helm, Alfred Abel, Gustav Frolich and others who appear in Metropolis. That distance lends itself to an even deeper commitment of our suspension of disbelief, I think. What I mean is, the characters themselves don’t lurch us out of the film and back into reality because they are, for the most part, completely unknown to us. We come to them somewhat empty and unformed and let them help us fill in the tapestry of t he film-going experience. From the decimal clocks to the mechanistic and dehumanizing social stratification, Metropolis presents myriad and multi-layered facets. As a writer this fascinates me as well. Fritz Lang is juggling a lot of crystal balls with this movie, and he keeps them in the air and moving in an intricate pattern. It’s an incredible artistic accomplishment given the breadth of the work. 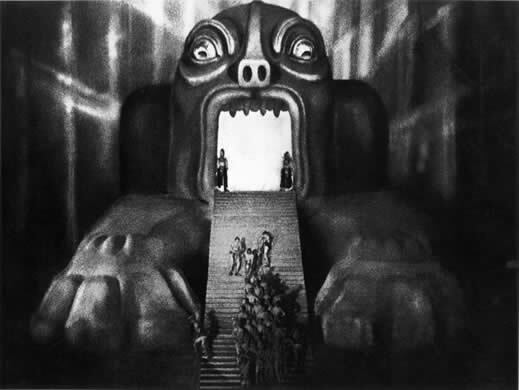 The art direction for Metropolis set the bar. It is phenomenal. Even when you consider the sense-shattering impact of German expressionism, there are so many elements to Metropolis, so much packed into every scene without either the story or the look of the film becoming top heavy, that it just melds together as one entity. As for story, which as a writer I tend to concentrate on above all else, it works, too. Oh, the basic qualities of the story are a bit long in the tooth: a social and economic clash between two distinct classes, blah blah blah. But even old stories gain new life when they are peopled by actors who interpret their characters as three-dimensional beings. I find the actors did an admirable job of this in Metropolis. We’ve seen the basic story before. We have not seen this interpretation before, I don’t think. At least, not played out like this. Of course, of all the cast, it is Maria, played by Brigitte Helm, who stands head and shoulders above everyone else. From her transformation from Christ-like figure to robot, she is right on target and completely steals the movie. Her image continues to endure right down to today. Watching the evil Maria Robot I also get the impression a lot of background work went into developing that character. Watch how Maria moves and interacts with the other actors. Watch her facial expressions, her gestures, the small moments she brings to the screen. It is like nothing I have ever seen in any other science fiction film — ever. Today, when we see robots on the silver screen, they either move in some mechanistic stop-and-go action, or like any other ordinary human being so they can hide among us. Think C-3PO from Star Wars to Number Six in the Battlestar Galactica remake as separate ends of the knowable spectrum. But Helm’s interpretation of Maria is the only truly inhuman robot I think I have ever seen. She moves and acts and gestures like something completely and totally alien to our experience. It is an amazing feat, and it is downright creepy. To be sure Metropolis is not a perfect film. The philosophy “The mediation between head and hands must be the heart” becomes repetitious and I can’t help but wonder if we are not losing something in the translation from the original German which accounts for its awkwardness. There are also the usual filmatic standardizations and slogging character development that we have to suffer through upon occasion. But for the most part this film rocks. One of the best parts is fans and collectors are always finding new snippets excised from the original film stock. So over the years they have built and patched the film into the original shape Lang meant it to be viewed in. I like Metropolis. As someone who works in genre I can’t deny the impact the film has had upon science fiction. As someone who loves film, I can’t deny the impact it has had upon the industry as a whole. It’s just amazing to me how a film can reach higher than itself and become almost atavistic to genre. As if all that has passed since its release must by necessity narrow down to the nexus of its existence and draw creative sustenance. I think Metropolis does that, at least on a small level, if not large. It reaches beyond itself and becomes something greater, not just in flim but as it relates to knowable human experience. In the process, we are swept along and bounced from crest to wave. Wonderful review of a great film! I saw this a year or so ago on the big screen with a special sound track performed live — it was a truly moving experience. Thank you, very much, for that. I am really flattered you liked the review. It is an amazing film, isn’t it? And somewhat transformative, I found. You’re welcome. Have you ever seen a silent film with a live soundtrack? I also saw Lang’s epic Siegfried — with a post-rock band — an odd combo but again, quite the experience. I haven’t seen a silent film with live music, but I would love to. I bet it’s a fascinating experience. I’ve never seen Metropolis. Clearly, I’m going to have to fix that. Good call linking to this one on LJ. I caught it a couple of years ago, and thought much the same about it. I don’t have much to add to your awesome review except that a complete edition has now been found (here in Buenos Aires, no less), and released just this year, and that the scientist’s lab in the film became the basis for all the ones that followed until the seventies. Oh, that’s right! Now I remember that they did find an almost complete print of this movie down there. How awesome is that?